Watch the Live Stream below! Head to Facebook to post your questions and comments for presenters! How is the arts sector in Los Angeles and around the US working towards an inclusive and equitable future? 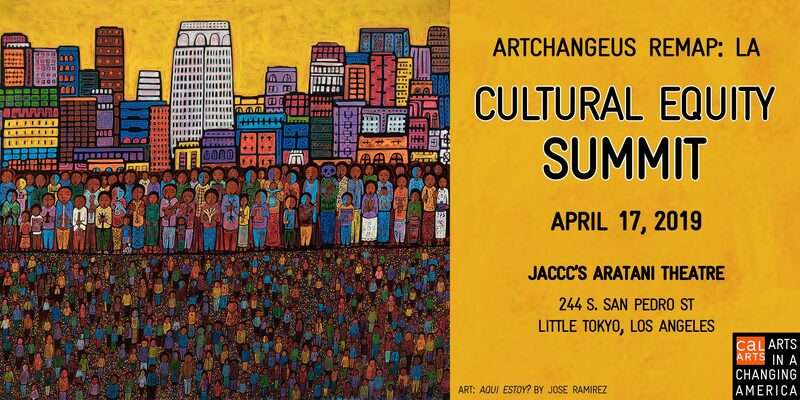 ArtChangeUS REMAP: LA Cultural Equity Summit will gather cultural leaders, artists, grantmakers, and community members to advance cultural equity strategies and innovative practices at the Japanese American Cultural and Community Center’s Aratani Theatre on Wednesday, April 17, 2019 in Little Tokyo, Los Angeles. Participate in grounding tours of Downtown Los Angeles experiencing the murals of Winston St. and exploring historic sites of Little Tokyo. Participants include: Betty Avila (Executive Director, Self-Help Graphics), Roberto Bedoya (Cultural Affairs Manager, City of Oakland), Julia Bogany (Tongva Cultural Educator and Elder), Danielle Brazell (General Manager, City of Los Angeles Department of Cultural Affairs), Tom DeCaigny (Director of Cultural Affairs, City and County of San Francisco), Alison De La Cruz (Vice President of Programs, Japanese American Cultural and Community Center), Randy Engstrom (Director of the Office of Arts and Culture, City of Seattle), Tom Finkelpearl (Commissioner, New York City Department of Cultural Affairs), Quetzal Flores (artivista and ACTA Program Manager), Ebony Noelle Golden (CEO and Principal Engagement Strategist, Betty’s Daughter Arts Collaborative), Ben Johnson (Performing Arts Program Director, City of Los Angeles Department of Cultural Affairs), Gaye Theresa Johnson (Associate Professor of Chicana and Chicano Studies and African American Studies, University of California at Los Angeles), Sofia Klatzker (President, Roman Mars Foundation), George Lipsitz (Professor in the Department of Black Studies, University of California at Santa Barbara), Daren Mooko (Interim President & CEO, Japanese American Cultural and Community Center), Margaret Morton (Director, Creativity and Free Expression, Ford Foundation), Nobuko Miyamoto (Founder/Artistic Director, Great Leap), Steve Nagano, Debra J.T. Padilla (Arts Activist/Consultant), Pamela J. Peters (Navajo, Multimedia Documentarian), Emiko Ono (Program Director of Performing Arts, The William and Flora Hewlett Foundation), Rudy Ortega Jr. (Tribal President, Fernandeño Tataviam Band of Mission Indians), Kristin Sakoda (Executive Director, Los Angeles County Arts Commission), Beatriz Solis (Program Director of Healthy Communities South Region, The California Endowment), Eddie Torres (President and CEO, Grantmakers in the Arts), Tamica Washington-Miller (Associate Director, Lula Washington Dance Theatre), Roberta Uno (Director, Arts in a Changing America), Rick West (President and CEO, Autry National Center), and Stephen Zeigler. Artistic shares by FandangObon, Malesha Taylor, Morongo Bird Singers, Urban Jazz Dance Company and others. Opening led by Rudy Ortega Jr., Tribal President of the Fernandeño Tataviam Band of Mission Indians, Julia Bogany, Tongva Cultural Educator and Elder, and Daniela Alvarez, ArtChangeUS Education and REFRAME Coordinator. Welcoming Remarks by Daren Mooko, Interim President & CEO, Japanese American Cultural and Community Center, and Roberta Uno, Director of ArtChangeUS. Our LA: Cultural Community Anchor leaders Betty Avila, Executive Director, Self-Help Graphics; Alison De La Cruz, Vice President of Programs, Japanese American Cultural & Community Center; Tamica Washington-Miller, Associate Director, Lula Washington Dance Theatre; Rick West, President and CEO, Autry National Center and Interlocutor Debra J.T. Padilla, Arts Activist/Consultant. We Work For You: A public sector discussion led by heads of city arts agencies moving research into action from Los Angeles, New York, Oakland, San Francisco, and Seattle. Kristin Sakoda, Executive Director of the Los Angeles County Arts Commission and Tom Finkelpearl, Commissioner of the New York City Department of Cultural Affairs, will share public sector efforts to advance equity based on their city’s diversity and inclusion studies and will be joined in dialogue by Roberto Bedoya, Cultural Affairs Manager of the City of Oakland; Tom DeCaigny, Director of Cultural Affairs at City and County of San Francisco and Randy Engstrom, Director of the Office of Arts and Culture, City of Seattle. The dialogue will be facilitated by Ebony Noelle Golden, CEO and principal engagement strategist, Betty’s Daughter Arts Collaborative. Let’s Get Practical and Tactical: A roundtable of philanthropy leaders who have been advancing arts and racial justice through innovative initiatives and practices. Speakers include Sofia Klatzker, President, Roman Mars Foundation; Margaret Morton, Director, Creativity and Free Expression, Ford Foundation; Emiko Ono, Program Director of Performing Arts, The William and Flora Hewlett Foundation; Beatriz Solis, Program Director of Healthy Communities South Region, The California Endowment; and Eddie Torres, President and CEO, Grantmakers in the Arts. Roundtable moderated by Ben Johnson, Performing Arts Program Director, City of Los Angeles Department of Cultural Affairs. Closing remarks from Danielle Brazell, General Manager, City of Los Angeles Department of Cultural Affairs. FandangObon performance presented by Quetzal Flores (artivista and ACTA Program Manager) and Nobuko Miyamoto (Founder/Artistic Director, Great Leap). Local food vendors featuring the many flavors of Los Angeles! Please gather at 2:20pm in front of the Center. **Each visit limited to 25 people on first registered basis. If you’d like to attend, please select a visit at registration checkout. Please wear comfortable footwear and bring sun protection. Within the streets of Skid Row in downtown Los Angeles, there is a section that many people don’t know about. The place is 421 Werdin Place, coined “Indian Alley.” Indian Alley is a place with a sad, tragic dark history to the urban American Indians during the 1970s and 80s. To address these issues, United American Indian Involvement (UAII) opened its doors at 118 Winston Street in 1974 as a substance abuse treatment center. Through the years the building grew into a non-profit service center to assist urban Indians in Los Angeles County. Today, with the supervision and support from unofficial steward Stephen Zeigler, who moved to the alley-adjacent building at 118 Winston St. in 2008, Indian Alley has a dozen or more murals that have been painted by Native American and non-Native American artists. Stephen researched and cleaned the street to provide a positive environment with art. Indian Alley today is commemorated by artwork bringing new lifeblood to the city by providing healing and strength to a once bleak dark history. The alley has become a tourist attraction, as well as a local point of interest. Art fans come to the alley to see work from Native American artists such as Jaque Fragua (Jemez Pueblo), Votan (Mayan), Steven Judd (Kiowa/Choctaw), Christian Armstrong (Akimel O’odham), Carrie Curley (Apache) — the first native female muralist to showcase her work in the alley, as well as Los Angeles, Tongva artist River Garza. The new artful images in the alley are a modern contemporary showcase of Native American existence in Los Angeles. It’s also a place of healing the dark history. The tour of Indian Alley will discuss the history behind Winston Street, along with the past and present artwork in the Alley. The alley has been an integral part of the urban LA Indian community. Join us for a dialogue on cultural organizing strategies rooted in traditional arts practice with artists from ACTA’s Building Healthy Communities work in Boyle Heights: Juana Mena, Ofelia Esparza, Omar Ramirez, Quetzal Flores, and Rosanna Esparza Ahrens in conversation with UCSB Black Studies Professor Dr. George Lipsitz. **Limited to 50 people on first registered basis. If you’d like to attend, please select a visit at registration checkout. Join in community with Summit participants for an informal evening of meandering conversation, meaningful connection and light refreshments! Select option at checkout. LA County Arts Commission is offering limited scholarships covering the cost of registration. To qualify for a scholarship, you must be a staff or board member of an organization that is currently funded by the Arts Commission’s Organizational Grant Program, and has an operating budget of less than $5,000,000. ArtChangeUS would like to acknowledge the Tongva peoples and Fernandeño Tataviam Band of Mission Indians as the traditional, current, and future inhabitants and caretakers of the lands of the City and County of Los Angeles. REMAP will continue through Spring 2020, engaging in deep learning about the cultural communities of LA, cultural equity, the active legacy of cultural anchors, strategies for arts-led and place-based advocacy through participatory workshops, Cultural Community Benefit training, discussion, and neighborhood listening tours around the city of Los Angeles. The Aratani Theatre is the crown jewel of the Japanese American Cultural & Community Center’s 2.2 acre campus in the heart of Little Tokyo. As the largest Asian Pacific American theatre in the country, this historic theatre serves as a multi-disciplinary presenting and producing space for JACCC, its partners and rental clients. For over 35 years, diverse communities have used the Aratani Theatre to gather and share their artistic work and engage in dialogue about relevant community topics. In 2018, JACCC completed a lighting, rigging and soft goods systems upgrade in the Aratani to complement the existing custom-designed Bose Professional Room Match System and NEC Displays Projectors. ArtChangeUS has developed this MOU in accordance with our Cultural Community Benefits Principles collaboratively developed by ArtChangeUS with Detroit cultural organizers based on their ongoing efforts to seek accountability, through community benefits agreements, from private developers who receive public support for large-scale development projects. ArtChangeUS and its Core Partners are sharing this MOU with the wider cultural sector to provide a values-driven and pragmatic approach to shifting our field’s institutional practices while building equitable relationships. REMAP is planned in collaboration with ArtChangeUS Core Partners: Alison De La Cruz (Japanese American Cultural and Community Center), Ben Johnson (City of Los Angeles Department of Cultural Affairs), Amy Kitchener (Alliance for California Traditional Arts), Natalie Marrero (Viver Brasil), Debra J.T. Padilla (Arts for LA), Randy Reinholz & Jean Bruce Scott (Native Voices at the Autry), and Tamica Washington-Miller (Lula Washington Dance Theatre). Advisory Council: Sofia Klatzker (Roman Mars Foundation), Leslie Ito (Armory Center for the Arts), Dr. Mishuana Goeman (University of California, Los Angeles), and Pamela Villaseñor (Fernandeño Tataviam Band of Mission Indians).